The popular Tayrona Park lies at the Caribbean coast near Santa Marta in Colombia. It has some of South America's loveliest coastline. This little, delightful spot is located about 30 minutes from the city of Rodadero, with beautiful beaches, hammocks to rent for the night, food, water and surf (be careful, though; there is a strong riptide - experienced surfers only!). 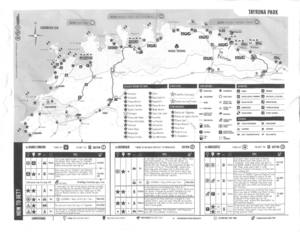 Additionally, you can get a guide to take you to a native village in the nearby mountains. The concession of the Tayrona National Park was created in 1964 and it is located on the Caribbean Coast in the north of Colombia, only 34 km from the city of Santa Marta. it has not only an immense natural importance in this region, but it is also a cultural treasure. 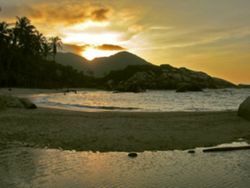 A long time ago, small groups of hunters and gatherers inhabited the park, and towards the VI and the VII century, both the coast and the mountain of the park were habited by the famous Tayrona tribe. You can admire their culture nowadays, because the Koguis, their direct descendants, as well as three other indigenous groups, still live in these areas and they maintain many of their traditions. The park offers a big variety of Flora and Fauna because it includes two ecosystems between the mountain and the sea. It boasts fascinating wildlife including red howler and titi monkeys, red woodpeckers, iguanas, jaguars (which are rarely seen as they hunt at night), a variety of lizards, tropical marine life, and more than 400 species of birds, such as eagles, condors and the odd pet parrots kept at the restaurant at Arrecifes. The vegetation is characterized by the ecological influence and the rain depending on the sector, from tropical dry forest to coral reefs. The temperature varies betwen 25°C and 30°C, depending on the location and elevation. There are two rainy seasons from May to June and from September to November. Humidity within the rainforest is very high. Cañaveral is the only place which can be reached by car, on the paved road from the main El Zaino entrance. Camping is possible. Nearby Aviatur offers pricey Ecocabanas with view of the Sea, the so called Ecohabs for C$550,000 - C$646,000. There are also accommodation options on the road into Cañaveral. La Piscinata (not to be confused with La Piscina below) is the beach near the Ecohabs and is suitable for swimming (with a lifeguard on duty). Arrecifes has 3 places which offer accommodations: At the pricey end Aviatur has Ecocabanas for C$300,000 but also allows camping. El Paraiso offers cabanas for C$100,000 and hammocks or camping for C$20,000 (July 2018). A short walk further brings you to a place with reggae music that offers hammocks and camping for C$15,000 (July 2018). All three places offer food and sanitary services. 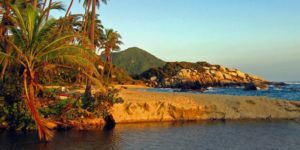 El Cabo is a campground and restaurant facing a pair of spectacular beaches separated by a rocky outcrop. You can either stay in hammocks (C$40,000pp March 2019) or in 2 person tents (which can be rented there for a total of C$80,000 (March 2019). There is also a two story wooden bungalow on the rocky point. This features two simple rooms with double beds on the top floor(C$150,000 per night; old price), and a bottom floor with premium hammock space for rent. All reservations must be made on site. Common toilets and showers are available. Breakfast, lunch, and dinner are served at the restaurant, which is decent and affordable (20 - 40 000 per meal, March 2019). From Santa Marta take the bus from the corner of Calle 11 with Carrera 11. The bus joins Calle 15 at the junction with Carrera 16 and takes Avenida El Libertador south-east from the city so you can hail the bus on Av. El Libertador if you are staying on the route. It leaves about every half hour and costs C$7,000 (July 2018). Ask the bus driver to drop you off at the park entrance, it is about one hour and can't be missed or to the closer town Calbazo (C$6,000, July 2018) which is another park entrance. If going directly from the bus terminal, there's a supermarket across the street in case you want to buy water or food for the park, and a taxi ride from the terminal to Mamatoco is about COP 4,000 to COP 5,000 (only 5 mins drive). From Mamatoco, a shuttle runs to the park entrance frequently (passing through Calbazo). This is closer and more economic than going to the city centre for the shuttle if going directly from the terminal. From the park entrance it is another 4 kilometres to Cañaveral. You can either walk, take a van for C$3,000 or try to hitch a ride. From the entrace to Arecifes is all in all a walk of about 1.5 hours, but you can see monkeys and other wildlife along the way if you walk. From Calbazo it's 4 hours walk on a steep but well marked path. The path will pass through the indigenous village of el Praha Pueblito and arrive on the cost to Cabo San Juan (where a boat leaves in the afternoon) or Playa brava. A taxi from Santa Marta or the bus station (about 30000 COP) to the park entrance might be an alternative for groups of 3 or 4 persons. With a large number of people it might work out cheaper to rent a boat from Santa Marta or Taganga. There are a few camping areas in front of the park entrance that charge approximately C$3,000 per tent. This is an alternative in case you cannot get into the park the same day of your arrival. GPT  offers now low emission rides from Santa Marta to the Tayrona Park and other destinations in this area. You can catch a boat from the beach front at Taganga. The boats leave fairly early in the morning (anything from 9.30am) and tend to leave if they have enough people, so it's best to get there earlier. The boats are easy to see as there is usually a group of people waiting to tout the spaces or waiting to get on the boat. It is more expensive than getting the bus (about C$25,000) but the boat ride is only 1-1.5 hours, depending on the quality of the engine of the boat and the roughness of the sea. The ride can be fairly rough, a kind of hold on to your hats kind of a ride, but it all adds to the adventure. Make sure you got your cellphone and electronics well protected from water. The boat drops you straight at El Cabo, so if you are planning to stay there it is ideal. You can always take the boat to El Cabo and spend some time trekking to the end and then getting a bus out. The boats also leave El Cabo for Taganga, but this is fairly early due to the tides, they normally leave about 4pm (C$45,000). The entrance fee per entry is 56,000 COP for foreigner (July 2018) + 2,500 COP mandatory insurance per day. 16,000 COP for Colombian citizens and 8,000 COP for students (you must bring student ID AND copy of passport to prove you are 25 or under) and children from the age of 5 to 12. Bags and personal belongings are checked at the park entrances, (was not performed in July 2018). Walking inside the park is only allowed between 8am and 5pm. Take lots of food and water with you, it's expensive inside the park compared to Colombian standards. For example a beer can is 5,000COP - 6000COP. Prices of food vary little between places. Do not forget that bringing in your own alcohol is prohibited, and your bag may be checked. While we usually frown upon avoiding to pay park entrance fees, we dislike that tourists pay four times more than locals as well. If you want to avoid paying the entrance fees, try entering the park around 4pm from the village of Calabazo - could work. Also if you declare shorter stay you can avoid paying the mandatory insurance which seems useless. El Zaino Entrance to Cañaveral A colectivo can be caught from El Zaino entrance which will take you to the start of the walk/hiking trail at Cañaveral (10 minutes, COP3,000). You can take the walk by yourself along the road without having to pay for the colectivo (1 hour). Cañaveral to Arrecifes Mules/donkeys can be hired to transport you and your luggage to Arrecifes, but are mostly used for transporting groceries (fruit, food, drink and water) to the local restaurants in the park. You can also hire a horse for a fun 30 minute ride to Arrecifes for COP17,000. The walk/hike to Arrecifes is about 45mins - 90mins, depending on how much you stop to observe the local fauna and flora. During the rainy season it is recommended that hiking boots/trainers are worn for the duration of this walk, as it can get really muddy and slippery. There is also a second route used by the workers and the mules, its not as picturesque (no sea views, no paneled walkways) but its a lot quicker (45 mins for a casual walker) and could be useful if you arrive late and need to get to El Cabo before all the Carpas sell out. If you turn left into the stables, walk through and follow the horse tracks and old signs you'll end up at Arrecifes, on the return journey just go straight ahead out of Arrecifes and follow the horse tracks for this short cut. Arrecifes to La Piscina The walk/hike from Arrecifes to La Piscina is about 15-20 mins, the majority of the walk is along the beach and sea edge with some palm forested areas. La Piscina to El Cabo The walk/hike from La Piscina to El Cabo is another 15-20 mins, but well worth it once you arrive. Another trail from Arrecifes to El Cabo leads through the jungle and joins the 'beach trail' later on. A 1-2 hour uphill hike from El Cabo is El Pueblito (2.4km distance, 260m elevation gain), an archaeological site similar to Ciudad Perdida only much smaller in size. (11°19'0.92"N, 73°58'43.38"W). The trail starts from to the right of the toilet/shower block in El Cabo and is signposted. You can hike all the way from Pueblito to the highway (an extra 5.2km). There are some small (but possibly intimidating to the inexperienced) scrambles over large rocks, which may seem scarier on the way down. From Arrecifes (11°18'51.23"N, 73°56'58.24"W), there is a 15minute walk to the lagoon known as La Piscina (11°19'26.82"N, 73°57'33.01"W). A reef in front of the coast forms a natural swimming pool. If snorkeling, look out for rays and lobsters in the seagrass area closer to shore. Snorkeling at El Cabo is also a great pastime, provided the visibility is good. A variety of marine life including large tropical fish can be seen nearer the rocks and on the reef further out into the ocean. It is recommended to bring one's own snorkeling gear. Snorkelling was only allowed here in the shallows where there is little to see (January 2015). Around El Cabo there are a number of gorgeous beaches within easy walking distance, although some are closed to swimming on account of dangerous rip currents. Hanging out and being a beach bum for the day is advisable. Food in Tayrona is much more expensive than other places in Colombia (roughly double the normal price). As of July 2018, beer 0,33 COP5,000-6,000 Meals COP15,000-35,000. Travelers can get food from the different native or local restaurants present in Arrecife, El Cabo and La Piscina. The local food stalls serve up some wonderfully fresh arepas, try the fresh prawns, cheap and delicious. There is a variety of sea food, such as the tropical fish plate with rice and salad. Seafood dishes are also usually served with pataconés (fried plantain). Similar to bananas, plantains are usually firmer and not as sweet, with a neutral flavour like a potato. They are usually cut, fried and smashed into small pancake shapes, when they are fried again and served with food or as a snack on their own. The local restaurants have a varied menu which includes breakfasts (with scrambled egg as the basis) seafood, meat (particularly steak and chicken), chips (papas fritas) and pastas. It is advisable to get in early, to avoid the disappointment of being told the restaurant is out of the meal you requested. Meals are ordered and paid for before receipt. On the hike between Arrecifes and La Piscina, there is a panaderia (bakery). Here they do fantastic bread with chocolate or arequipe (dulce de leche, or caramel) baked in. The quiet little beach between La Piscina and El Cabo offers the best option for lunch. Fresh Ceviche (prawn, fish or mixed) made to order (COP15,000[S]-30,000[L] July 2018), freshly squeezed juice (COP5,000 - 8,000) and Arepas (COP 4,000 and up, July 2018). The restaurant at Arrecifes sells delicious freshly squeezed juices. Try a fruit juice mix of 'lulo' (a fleshy yellow fruit indigenous to the Carribbean coast)and banana or maracuya (a local brand of grenadilla or passion fruit). There may also be some vendors along the path selling freshly squeezed orange juice, which is a little pricey but welcome refreshment in the muggy heat. The tip is to ask for it without ice, so you get a full cup of pure juice. At Cañaveral there are the famous Ecohabs , luxury accommodation in small or big Huts from C$440,000/night/double occupation including taxes and breakfast. There are a couple of cheaper options on the road from the park entrance to Cañaveral, for example Jasayma Lodge , which offers beds for around C$200,000 or less if you can find a deal - try searching on booking.com. Breakfast is included and good-value evening meals can be arranged, including beer and wine. This is definitely recommended as the atmosphere over dinner is convivial, and you don't want to be wandering outside after dark. From Cañaveral it's a 45 minute walk to Arrecifes. There are some restaurants and places to sleep here: the Aviatur place and several independently run campings. Of these, Camping Bermudez is a cheap option (15000cop if you bring in tent, 9000 for renting tent, same price hammocks, July 2018). Don Pedro is a quiet and relaxing place where you will sleep in the midst of banana trees. Place to hand-wash your laundry available. Clean bathrooms, guest kitchen using wood and restaurant service available (15,000COP if you don't bring your tent, 8,000 if you do, 10,000COP for a hammocks, 2016). A hammock at the Aviatur place (the one with the fancy-looking reception desk) cost 30,000 COP per night, with a 10,000 COP deposit for a locker. 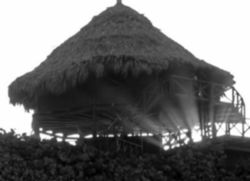 Hammocks were in good condition and appeared to be taken down and cleaned after every guest, and each had its own mosquito net, 2016. From Cañaveral you can also go in the opposite direction, and instead of the ecohabs you will arrive to the beach of Castilletes Cabana Tayrona, which is a beach without any crowds and you get a nice ensuite room for 80'000 per person. A hammock costs C$6,000 per night and a cabaña for 2 costs C$100,000 (Finca Paraiso) or C$300,000 (Aviatur). At the Aviatur camp site, price is C$11,000 p/p (small kids free), renting a tent incl. 2 mats is C$15,000. Another 30 minute walk is El Cabo. One of the most popular spots to stay the night, its like a beach resort with the atmosphere of a hostel. There are hammocks for rent (C$20,000 - C$25,000, depending on whether or not it's tourist season) and a camping area. In July 2017 (temporada alta, peak season) the hammock in the mirador was 50000 COP and the one in the main hammock area 40.000 COP (cash only, no ATM in the park). Youn also pitch your own hammock, saving you C$5,000/night. 2- 3 person Tents (Carpas) are also available at C$25,000 per person. They usually sell out by around 4-5pm, expect a long line. There is also a restaurant, serving expensive but safe food. There are a few electrical outlets in the dining area to charge your stuff and there are free lockers (although they can run out - bring your own lock). The bathrooms are basic and there are only four of them - expect long lines at peak times. Ditto for the four open showers. It might be quite busy here during your stay, which takes away the place's charm. Las Pleyades  offers also accommodation options outside the Tayrona National park at lower prices, but not more than 10 minutes by bus or car from the main entrance of Cañaveral or Pueblito in Calabazo. One of the tourist's favourite cabanas next to the Tayrona Park is Finca Barlovento , with an amazing setting between the river and the Sea. At La Piscina, there is a great guest house  that over looks the ocean and is perfect for large groups such as family reunions or yoga retreats or can be rented out by the room per night. The sea at Park Tayrona is rough and dangerous. Rip tides and powerful waves make swimming in the sea unadvisable, except for at the La Piscinita beach. Tourists looking for a "beach and sea" destination in Colombia would be better off visiting the islands Providencia or San Andrés. When arriving by bus to the park entrance, beware of the touts who pretend to be some sort of local guides and try to talk to you right when you leave the bus. They will push you to buy some of the accomodation on the spot. While their ofders May not be overprised, beware of what they try to sell you, as you May end up in a completely wrong place. If unsure about their ofders, simply decline and buy your accomodation while in the park itself. It has been known for local thieves to listen to see if people are asleep in their tent and then open the tent and steal what they can find. Make sure to either use the lockers, keep valuables close to your person or do not bring them at all. Lockers are provided for free in El Cabo. You need to bring your own lock, however they have locks for sale in the shop next door if you forget yours. The lockers are in various states of disrepair, so pick wisely. Test the door, lock, roof and base of the one you choose. Unfortunately there are several reports of people who were robbed by the security guards in the park. The guards precisely examine people's (especially non-colombians) bags for the purpose of founding drugs which are not allowed in the park. They will talk to you, give advises and are very nice. At the moment you are the most distracted they will take your money out of your wallet (which they also checked for drugs) or will hide some drugs in your bag to later find it. If they find drugs in your bag you have to pay a high fee. Even though you can trust policemen and security guards in other countries, you cannot in Colombia! Please be careful and put your money in different safe places. Don't let the security guards distract you from watching them checking your bags! The guards carry weapons, so talking to them about the stolen money won't help much. Take a boat to Taganga from El Cabo, or hike back to the highway and catch a bus to Santa Marta or Palomino. If you`re heading to Cabo de la Vela, catch a bus on the highway to Riohacha. They pass every 15-20 minutes, several companies. It takes 2-2.5 hours to Riohacha. By the main park entrance, some friendly and semi-official-looking agents may offer to organize a special reservation for you on one of the Luxury coach services to destinations like Cartagena. You should decline - they will simply relieve you of a wad of cash then flag down the next passing bus and put you on board. The following are prohibited from the park -musical Instruments -your own alcohol If it is visibly seen, park security will not let you in, but it is possibly to leave it a the security outpost located at the entrance. Where you can reclaim after you come out. this may inconvenient if you planned to take the boat from el cabo to Taganga.